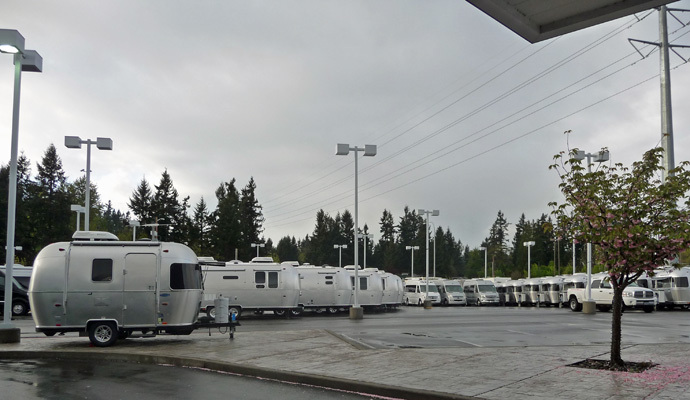 On Wednesday April 22nd, we left Champoeg State Park near Salem OR and headed north on I-5 to Olympia, WA and the Washington Land Yacht Harbor--returning after 5 months of wandering to the same park we’d left back on November 13, 2014. This is a really convenient place for us to stay with good WiFi and a full hookup at a really great rate. 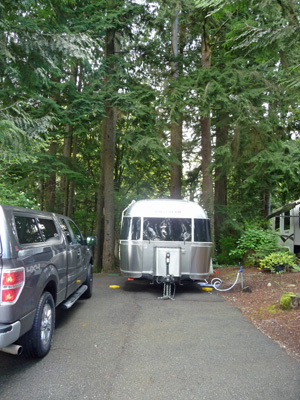 We spent the night and then got up early to arrive at the Airstream Adventures NW Service department for our long awaited warranty service appointment. Back last fall, we tried to have our range hood repaired. It had this odd habit of shutting off when we used all 3 burners for more than about 5 minutes—I know the simplest solution is to not cook anything complicated but I love having 3 burners... After working on it and talking to Airstream headquarters, who talked to the range hood manufacturer in Italy, it was decided we needed a new fan motor. They ordered the motor back in November, but then we left to go south. So they held it for us until we returned. We had a few other little problems (like a shower door that didn’t open properly—an odd little piece of plastic dropped out after we bumped down one too many washboard roads) and when we arrived they told us that they really didn’t think they could get it all done in one day. And sure enough, they couldn’t. So we spent the night camped out at the dealer. They parked us under a portico right next to the Service Department office. Here’s the view we had from the bedroom windows. It turned out to be a really odd place to spend the night. Everyone went home by 6 pm and then all those bright parking lot lights came on. We had a super bright light right over our sky light in the living room too. And Highway 18 produced a steady drone of traffic right past to the dealership. Let’s just say it wasn’t a restful night. Then at 6:30 AM the first of the service crew arrived and stood and talked right outside our windows. We were up and dressed by 7:30 and eating our breakfast as most of the crew walked by trying not to notice us sitting there at our dining room table eating oatmeal—really pretty funny. We took off at 8 am figuring it would be another full day before they were done. We’d done errands locally on Thursday so on Friday we drove up to Monroe to pick up our mail and visit our storage area. We were taking things slow since we thought we had all day, so we even took the time to stop by the Y and say hello to the crew there. It sure was nice to see so many of familiar friendly faces there—and our old neighbor Ray Ridout and his daughter too! Then wonders of wonders, they called to say they were all done and ready for us to pick up Genevieve at NOON! Wow. Of course we were still in Redmond doing errands so it took us a little while to finish up and get back (including driving in a HUGE downpour on Highway 18 on the way back). But in any case, we were hooked up and ready to roll before 3 pm that day. They couldn’t fix our shower door, so they’ve ordered a new one for us. The bad news is that it will take at least 4 weeks to arrive. The good news is that they have a dealership in the Boise, ID area so they’re shipping it there so we can get it installed while we’re camp hosting at Lake Cascade in Idaho starting in June—much better than having to wait until we’re back in the Seattle area in October. We motored on back over Tiger Summit on Highway 18 and then 3 miles west on I-90 to Blue Sky RV Park in Issaquah. This is the place where we stayed back in September when Walter had his cataract surgery. This time we had a spot nestled in amongst the trees. Instead of a view of brick wall, or other folks rigs that we had a couple of times here, we had a nice deep woods view. The only hitch was that when it rained the trees above us made the rain go plop plop plop on our roof. We spent 5 nights here this time, so we could go to the dentist, do errands, see friends and sort through and switch things in and out of the trailer and the storage storage area in preparation for the summer. We now have our inflatable kayak in the back of the truck (along with the bikes, the generator and the solar panels) ready for 3 months on the lake in Idaho. On Wednesday April 29th, we left the big city again to head south (209 miles) on I-5 back to Champoeg State Park (we even had the same spot we had back on the 21st and 22nd of April) to spend the night before heading for Carl G. Washburne State Park where we’ll be camping for the month of May while we give lighthouse tours at Heceta Head Lighthouse in the same park. After wandering for 11 months, we’re now entering a new phase of our adventure—staying put for a while. And we’re both excited about it. We’ll be doing lighthouse tours between 11 am and 2 pm four days a week (with 3 days off each week) from May 1 to May 31st. We’ll have plenty of time for exploring on our days off. There are trails in the park and many more just up the road at the Cape Perpetua National Seashore. The Washburne campground and beach (which is a 1/2 mile walk away) are many people’s favorites on the Oregon Coast. AND the grey whales will be migrating and the mothers and calves are often seen close to shore here in May. What a wonderful set of opportunities. Just a heads up. There is basically no cell signal (and so no hot spot for internet) in the campground where we’ll be staying in May. Some folks have managed to pick up a weak signal with external antennas so we may be able to get something using our signal booster. But we’re not counting on it. We supposed to be able to pick up a signal in the Day Use Area which is about a mile away and we will try to check our email there once a day or so. And we will be going into town at least once a week to use the free WiFi at the library. So if you write to us and you don’t hear back right away, it’s because we’re having internet issues, not because we don’t love you. And just for fun here's a preview of our month to come. 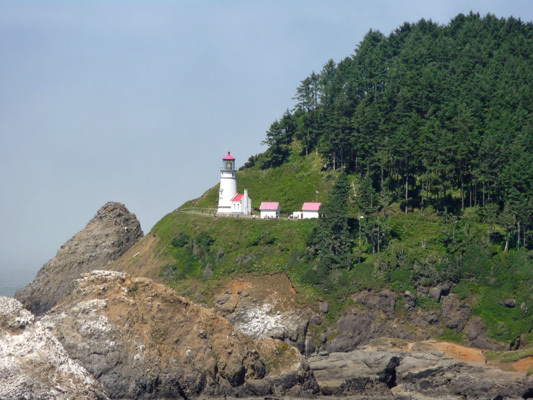 This is Heceta Head Lighthouse in a photo I took in July 2014 while we were camping down in Florence OR.